Whether you’re into comic books, antique jewelry, or vintage motorcycles, it typically takes a lifetime to build an admirable collection, years spent scouring flea markets, garage sales, and auction houses for each new addition. But for Joseph Makkos, a writer with a passion for antiquated printing techniques, his prized collection appeared all at once—in the form of a Craigslist ad offering thousands of historic New Orleans newspapers. For free. When Makkos first inquired about the collection in 2013, he found a room filled floor to ceiling with boxes, each stuffed with newspapers in protective tubing. “I walked down one row of boxes, counted horizontally and vertically, and did the math,” says Makkos. “Each row had at least a thousand boxes, so it was around about 30,000 newspaper tubes.” The earliest papers dated back to the 1880s, and the full collection included issues of “The Daily Picayune,” “The Times-Democrat,” and “The Times-Picayune,” which was created when the previous two papers merged in 1914. As a whole, the collection offers an amazingly detailed view of the city’s storied past—its politics, food, sporting events, local businesses, architecture, tragedies, and celebrations. Makkos had actually noticed a listing for the lot a few months prior, when the papers were being sold for $10 each, but because of minimal interest and an urgent need to clear the building they were stored in, the entire archive was now free. Free, at least, if the mysteriously unidentified seller could find a suitable new owner who would ensure the newspapers would be well taken care of. Makkos accepted the challenge and had his 30,000 newspapers out by the following Sunday. Top: A rotogravure supplement featuring futuristic fashions “of the Year Two Thousand,” from 1924. 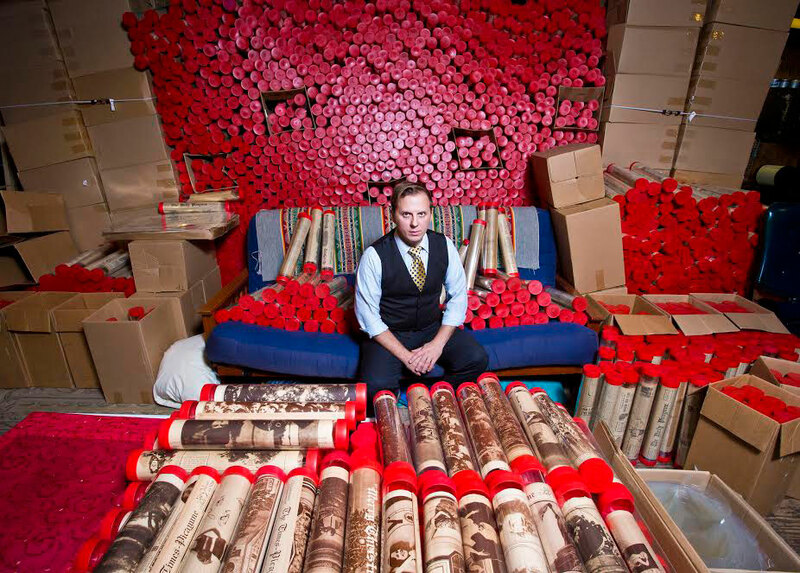 Above: Joseph Makkos sits among thousands of newspaper tubes in his New Orleans studio. Photo by Zack Smith. Makkos realized that the most distinctive printmaking processes, such as foil-stamping, die-cutting, and embossing, are today mostly limited to mass-produced industrial jobs, as huge corporations are more likely to front the extra cost. He began experimenting with some of these unique methods for various small-scale writing projects, while also keeping an eye out for older print shops that were liquidating their machinery, which he used to start his own collection of binding machines, presses, type trays, and lettering. In 2006, Makkos stumbled across a defunct print shop called AF Laborde & Son Printers on Frenchman Street, in the heart of the New Orleans’ jazz scene. Following Hurricane Katrina in 2005, the business had shuttered and never reopened. “They were the most popular printers in the city from the turn of the 19th and 20th centuries,” he explains. “The shop was relatively intact, including a darkroom, an art director’s office, linotype machines, a composing table, a lead smelter, a paper cutter, and all sorts of print blocks and letterpress type.” After years of attempting to contact the owner, Makkos was eventually reached by the youngest Laborde son, who asked for his help cleaning out the shop. In return, Makkos got to take his pick from an amazing collection of printing equipment. 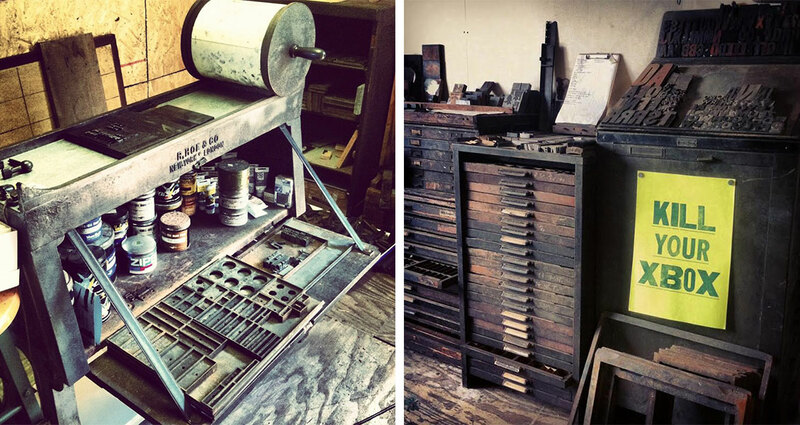 Scenes of Makkos’ workspace: Left, a proofing press made by R. Hoe in the late 1870s or early 1880s; right, drawers of type and a handprinted poster. Photos by Ashley Pastore. About a year later, Makkos came across the surprising Craigslist post, and was entrusted with this gigantic New Orleans newspaper collection. The archive has inadvertently introduced Makkos to certain outdated technologies, while also providing new subject matter for materials printed with his antique equipment. Now Makkos is working on several projects to give these newspapers new life, beginning with The New Orleans Digital Newspaper Archive, and encompassing local-history exhibitions, architectural-preservation work, and wearable merchandise. He’s also informally renamed the collection after Eliza Jane Nicholson, the innovative businesswoman who took ownership of “The Daily Picayune” in 1876 and helped it thrive. Apparently, the archive of New Orleans newspapers was bought by a dealer in Pennsylvania named Timothy Hughes, who purchased several shipping containers full of bound newspapers at auction from the British Library. After exchanging hands a few times, it landed in Makkos’ lap, and despite the collection’s excellent condition, all sense of organization had been lost. “When I open up a box, it’s like Christmas,” he says. “I’ll pull up one paper and it might be a Wednesday paper from 1899. Then I pull out another, and it’s a Sunday society section with a photo on it from the 1920s.” Thus far, the oldest newspaper Makkos has discovered is from 1885. 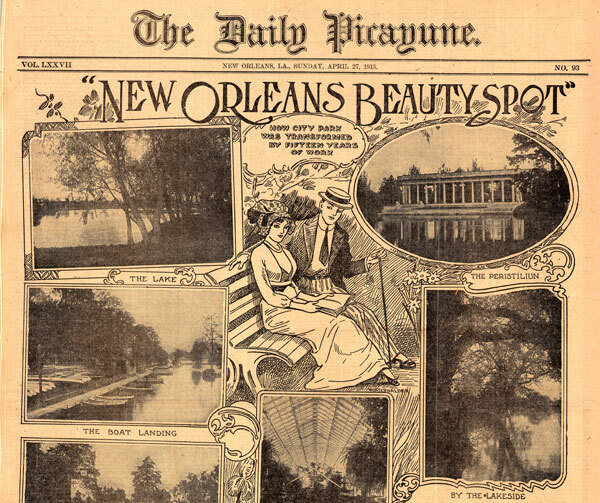 This 1913 feature section on “beauty spots” around New Orleans’ City Park shows how illustration and photography were combined in period newspapers. Nicholson Baker’s book Double Fold: Libraries and the Assault on Paper describes these massive library auctions in the late 1990s, and it led Makkos to much of his information about his collection. Makkos explains that many libraries deaccessioned their newspapers in an effort to create more space. Archivists also worried about the deterioration of paper sources, believing that transferring documents to microfilm would help them last longer. “Each generation of archivists and librarians has a new take on the best methods for preserving their materials,” says Makkos. The U.S. Library of Congress started microfilming books and manuscripts belonging to the British Library beginning in the late 1920s, and the American Library Association officially endorsed the technique in 1936. But the technology didn’t spread nationwide until after World War II, when microfilm labs like Bell & Howell began sending representatives to pitch their products to librarians everywhere. 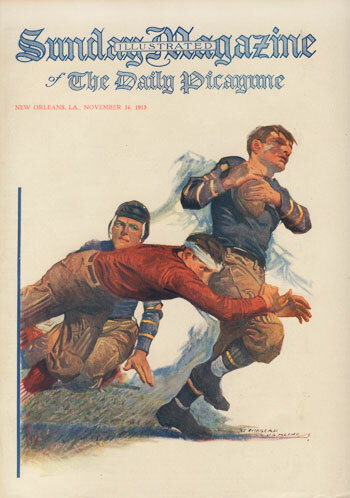 An illustrated cover of “The Daily Picayune Sunday Magazine” from 1913. Makkos’ New Orleans collection is particularly remarkable because it documents the publishing industry during a time of great change, visible in the adoption of new technologies for printing illustrations and photographs, as well as the expansion of coverage to include new sections like literature, comics, ladies’ fashion, health columns, a letter-writing club, children’s games, and a pull-out magazine. The archive spans a time period known today as the “Golden Age of Illustration,” lasting from the 1880s through the early 1920s. 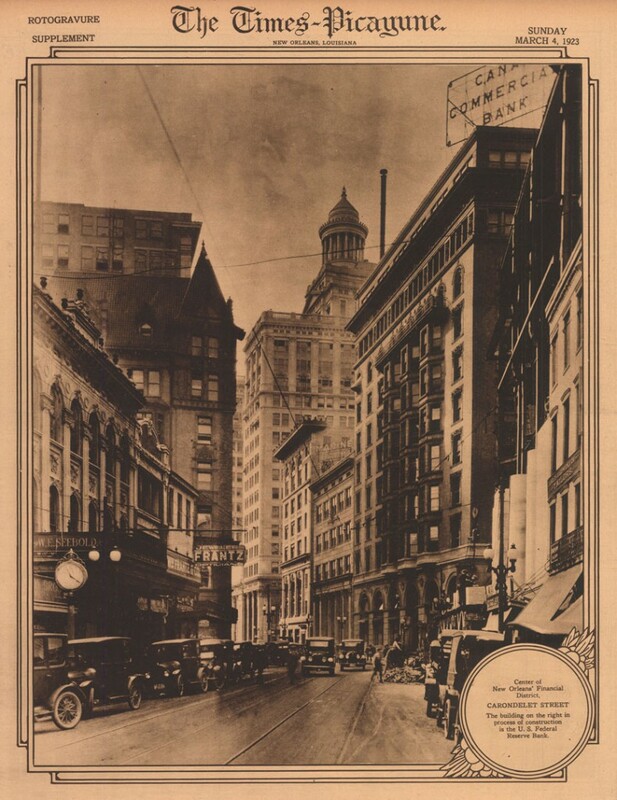 “Although cities like New York, San Francisco, and Chicago started bringing photography into the paper earlier, it wasn’t used in New Orleans’ papers until 1900,” says Makkos. New Orleans’ papers were also behind when it came to incorporating color, which began around 1913. 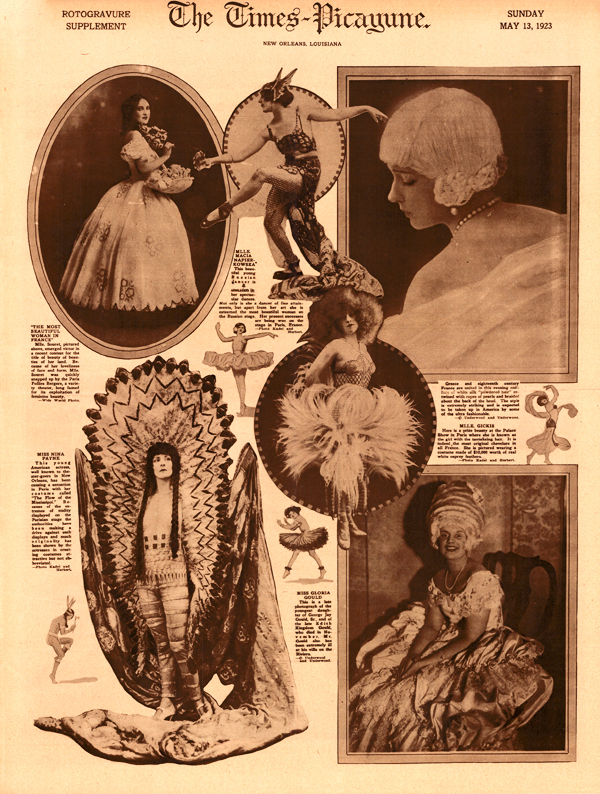 A 1923 rotogravure fashion section featuring outlandish costumes. Makkos has also come across a variety of near-forgotten technologies, like the gorgeous rotogravure photographs of the 1920s. 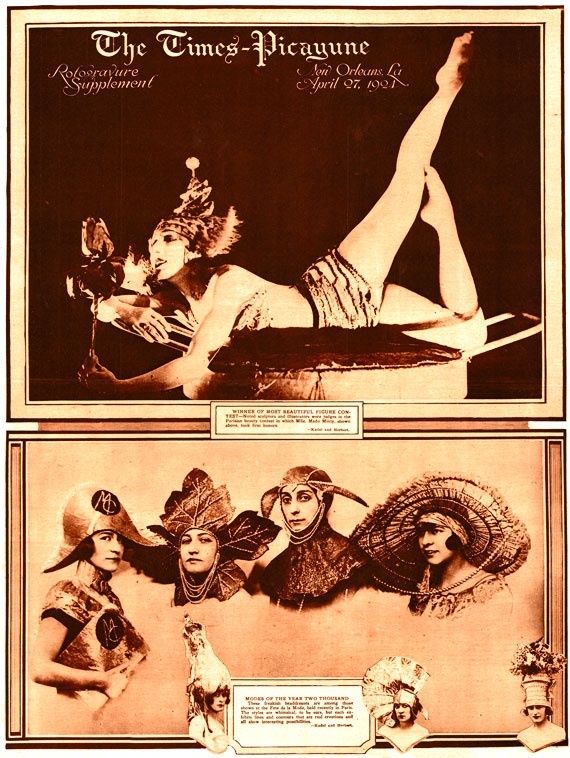 “I just acquired an advertisement for rotogravures from 1924 in the ‘Saturday Evening Post,’ and it explains the entire process,” says Makkos. “The rotogravure was actually an etched metal plate formed into a cylinder, so when the paper was sliding through the presses, the plate itself was the drum. This process created these super-clear photo images, way finer than a typical photo printed on newsprint. They even used different paper, and when you hold the gravures up to the light at the right angle, you can see this silvery shimmer. It has a satin finish to it, resembling silver gelatin prints.” Even in digital scans of the rotogravures, he says, the level of photographic detail is mesmerizing. As the story goes, Holbrook ended up divorcing his wife and marrying Eliza Jane a few years later. “Holbrook was her elder by 40 years, and he died a few years after they were married, but he left her the newspaper,” says Makkos. “There was a long litigation battle over its ownership, but she fought and won.” In 1876, Eliza Jane officially became the new owner of “The Daily Picayune,” although the business was $80,000 in debt, a colossal amount of money at the time. 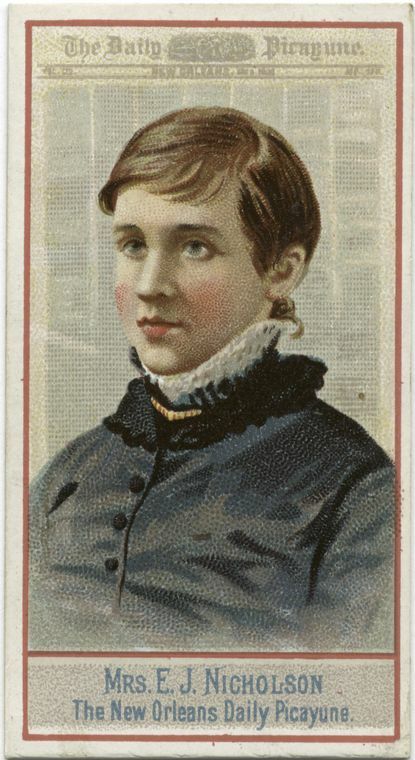 During the 1880s, Eliza Jane had the foresight to transform “The Daily Picayune” from a dry paper for white-collar men to one with coverage appealing to a variety of readers, and women in particular. “You can imagine the New Orleans businessman just sitting on his lunch break, puffing on a cigar in a cafe in the French Quarter or in his office, reading the price of cotton or bananas or whatever, reading about the markets and these international news stories,” says Makkos. 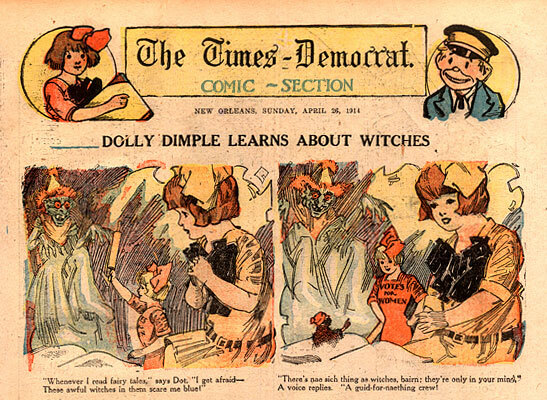 A cartoon entitled “Dolly Dimple Learns About Witches,” from 1914. Another important feature Eliza Jane introduced was the “Ask Dorothy Dix” section, which became one of the most widely syndicated advice columns in history. “By the late 1880s, Eliza Jane was able to hire and employ women, paying them the same rate she was paying men for writing articles,” Makkos adds. “So she was this proto-women’s rights character, but she wasn’t this flag-waving suffragist. She never subscribed to that sense of politics. 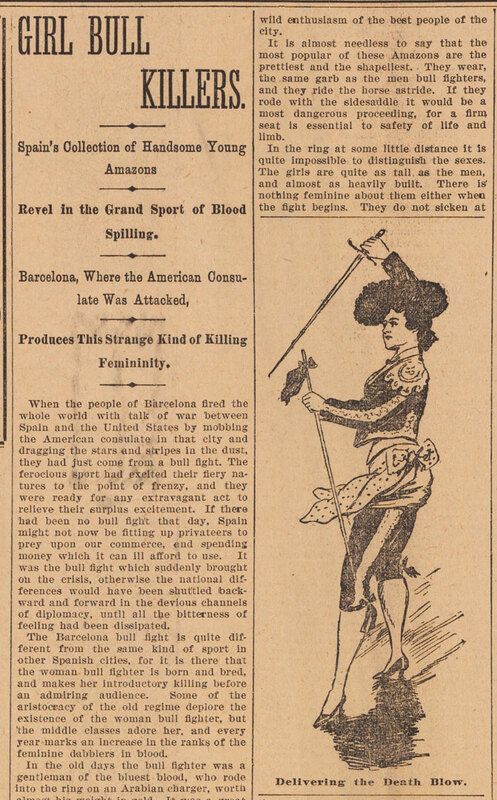 This 1896 story on female bullfighters in Barcelona, Spain, inspired Makkos to write an article on bullfighting in New Orleans. Makkos’ collection includes ample coverage of historic New Orleans architecture, like this 1923 view down Carondelet Street. From the balconied architecture of the French Quarter to the plantation-style mansions of the Garden District to the industrial blocks of the Bywater neighborhood, the physical fabric of New Orleans owes much to its unique history. And as Makkos has discovered, details of the city’s architectural heritage are well-documented in the pages of its historic newspapers. The New Year cover for a rotogravure supplement in 1928. In New Orleans, history and the present often overlap in strange and beautiful ways. Visitors praise the city’s “European” vibe, though its allure really derives from a blend of influences not found anywhere else—a Creole culture formed from the influence of African American, French, Spanish, and Native American ancestry. Using his collection of newspapers, Makkos is in the process of unearthing details of that heritage that even locals haven’t seen before. 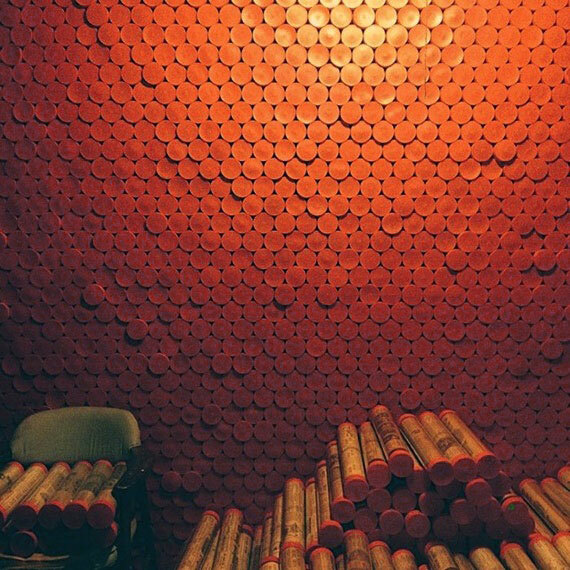 A wall of newspaper tubes in Makkos’ studio. Photo by Ashley Pastore. Wow a beautiful collection ! Good for you saving this history . The future generations will sing your name! As a Preservationist and mass media academic, your find is stunning. One caveat: if it was published in the newspaper, it was common to the public. It was socially acceptable for your children to read. Just because past generations censored history, doesn’t mean the facts aren’t there. If it was in the paper, it was on the streets. Thank you for saving this great collection of New Orleans history. Your reward will come as you read the many articles and the various advertising. Thank you for preserving this history. My grandmother was a surgical nurse at Touro, and a graduate of the nursing school there (1915). These are the sights and scenes she would have seen. Thank you for sharing these. “ ” The Piano Drop definitely started Woodstock. In our own minds, of course.